Many people say being a vegan is a personal choice, and this is understandable, considering the world we are raised in. But personal choices affect only the person making the choice. It is a personal choice how to style your hair or paint your house. Harming others isn’t a personal choice. Even if you think animals aren’t ‘others’ a non vegan diet also harms humans. This is because animal agriculture, large or small, organic or not, is the biggest contributor to climate change. More than all the transportation systems in the world combined. It is also a major user as well as polluter of water, and a major cause of deforestation, responsible for as much as 90% of Amazon destruction. Being a vegan is the biggest thing one can do to reduce pollution and save water. You save more water by going vegan than by not showering for six months. One burger equals two months of showers. Apart from that, it also contributes to world hunger. This is because it takes a huge amount of food to produce even a small amount of animal products. Sixteen pounds of grain to make one pound of beef, as sown above, is normal. If we ate the plants directly, we would feed way more people on far less land. 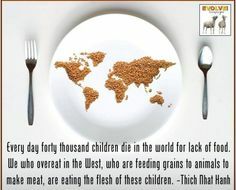 It has been estimated if the world were vegan, we could feed 14 billion people. It is really the only way to feed our growing population. And if you think human overpopulation is a problem, consider the fact that we slaughter around 65 billion land animals ever year for food. Sea animals number in the trillions. And animals are not objects. We would not consider it a personal choice for someone to beat their dog, nor would it be a personal choice for them to pay someone else to beat their dog, so why would killing and eating animals be a personal choice? it isn’t a personal choice to be a vegan, it is a moral obligation. Next Post Veganism without veggies?